While cash flow is more important when it comes to financial independence, it's still good to look at the balance sheet too, which is why I provide these net worth updates. Since more and more of my net worth is tied to the markets, there's a larger correlation between my net worth and the markets but in the long run as I continue to save and invest the net worth trend should be higher even though short term fluctuations can vary wildly. As a dividend growth investor I'm not overly concerned with the short-term gyrations as long as the dividend stream remains in tact, but the markets' effect is noticeable. The S&P 500 marched higher yet again during July climbing higher by 3.6%. Since the majority of my net worth is tied to the performance of the markets my net worth moves in line with the markets. So good months in the markets typically turn into good months for the net worth and vice versa. Of course I love getting to see those dividends roll in each month because they're always a positive portion of return. In July I received over $270 in dividends across all 3 of my accounts. For the month our net worth decreased $2,432.54. I can hear it now I said earlier that good months in the markets mean good months for my net worth. Well, normally that's the case and if we looked at just the investment accounts it held true. Across all of my investment accounts there was a $10k+ increase or about 2.7%. So why the decrease? Well, it's a bit hard to make up for an extra $8,700 one time expense, especially with no income source. That was the cost of getting a new roof put on our house during July. So I'm okay with seeing a $2k decrease when our expenses were almost $9k higher than usual. For July our net worth decreased 0.5% and year to date it's risen 16.4%. At this time I don't see the point in paying extra on the mortgage at this time given our relatively low interest rate as well as the tax break on mortgage payments and think we'll come out much further ahead investing the extra cash flow. So the liabilities side of the net worth equation will be slow moving. However, once the FI portfolio is able to get to a self-sustaining level of dividends then the plan is to aggressively pay down the mortgage. As of the end of July we have 23.7% equity in our house based on our purchase price from 2013. According to Zillow our house has increased just over $15k in value from our purchase price which is a nice bonus, although I'm keeping the purchase price as the value in the net worth equations. Based on Zillow's estimate the equity in our house is 28.5% thanks to the appreciation. 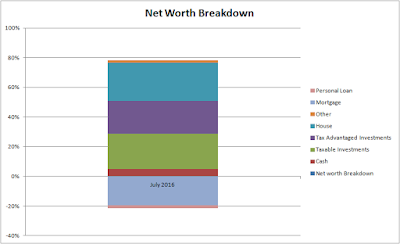 The following chart shows my assets and liabilities, as well as my net worth, since January 2012. 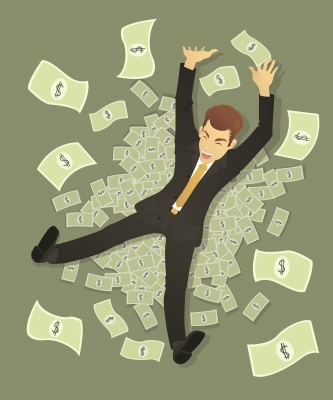 While I have accurate records for my net worth dating back to July 2010, I didn't keep track of my assets and liabilities on a monthly basis until the start of 2012. As I started with June's update I'll be including a % breakdown of our net worth with each monthly update. The assets are broken down into cash, taxable investments, tax advantaged investments (401k, Traditional & Roth IRAs), house (using our purchase price) and other which covers things like our cars and various collectibles from when I was a kid. The liabilities are much simpler and fall into either the mortgage or a personal loan that we have. Let me know what you think of the new Net Worth Breakdown graph! Truly passive income, dividends and interest, totaled to $263.31 during July which is about a $20 decrease from April's total of $284.25. *The dividends are from my taxable accounts only. Adding in the gross income earned from blogging/writing added another $143.54 to the monthly non-day job income total. That's a total of $406.85 of income that's not related to a regular 9-5 job. We've still got a long ways to go to reach our goal of financial independence, but we're heading in the right direction. Year to date we've generated over $5k outside of traditional employment sources. I've updated my Progress page to reflect July's changes. Make sure you sign up to receive new posts to your email so you don't miss anything. And be sure to follow me on Twitter@JC_PIP to get up to the minute news of new purchases for my portfolio. If you prefer Pinterest or Facebook I'm on there too! How did your net worth fare in July? Did you ride the markets higher or take a dip like us? Please share your thoughts in the comments below. Image courtesy of holohololand on FreeDigitalPhotos.net. Wow, a $10,000 expense is a large one. But if you amortize it over the life of a roof ( say 120 months), it doesn't sound so bad. Would it be fair to say that this roof will be fine for a decade? I have always rented, but the low forward returns on investments are making me rethink that stance. The problem is that if I buy, I will end up with space that is twice the size of our apartment, though the mortgage and taxes will likely be 20% more than the rent amount. Of course, I don't know if I will be here for the next decade. :-( We do not want to buy a condo.. In the MW it seems that buying may be a better option than renting if you can stay for a decade. I would be interested in your thoughts on buy vs rent. The joys of homeownership! The shingles are technically 30 year shingles although I don't think you ever hear of them lasting that long down here because of the heat. I think between 10-20 years is more the norm for a roof lifespan in the Houston area. The rent v buy discussion is always interesting. Like everything else related to money the most appropriate answer is "it depends". Before purchasing a personal residence I would focus mainly on why you want a house. If you don't want to deal with all the repairs/maint. yourself or don't need a bigger space or any other various reasons then I wouldn't buy. Essentially the non-financial reasons should be the driver behind whether you purchase a primary residence and the financial reasons should come into play when you're narrowing down your search. Owning a home really ties you down and limits your options. I'm not saying that's a bad thing because it can also provide stability, but it's much harder to deal with selling a home possibly into a bad market to be able to move rather than just waiting for a lease to end and making the move. You also don't have the option of moving to a lower cost mortgage if your budget gets tight like you can when you rent. Hope that helps to clarify my stance on the rent v buy and if you have any other questions feel free to ask away. All the best and its good to see your writings are starting to pay off! Glad you enjoy them and I hope they can inspire others. Hopefully you've been setting aside cash for capex for the rental to help ease the pain a bit. Unfortunately roofs are a necessary evil and they're a very expensive one at that. From what I've heard most roofs in our area last 15-20 years. The summer heat really takes a toll on the roofs. Spread out over the life of the roof the cost is reasonable considering a little problem with your roof can absolutely destroy the entire house. Thank you for including my post in your roundup JC. :) Have a great weekend. New roof is expensive but it will last at least 15-20 years. It's an expanse that you can't wait. If you wait for too long and end up getting a leak in the house, you end up needing to pay more for repairs. Should You Be Taking Profits In General Mills? Trouble Ahead For Kimberly-Clark Investors?